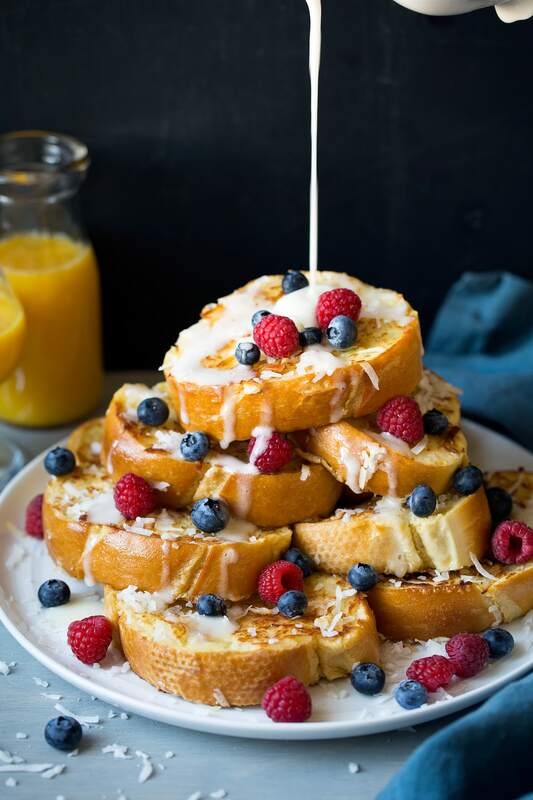 Coconut French Toast with Coconut Syrup has got to be hands down one of the best breakfasts around! 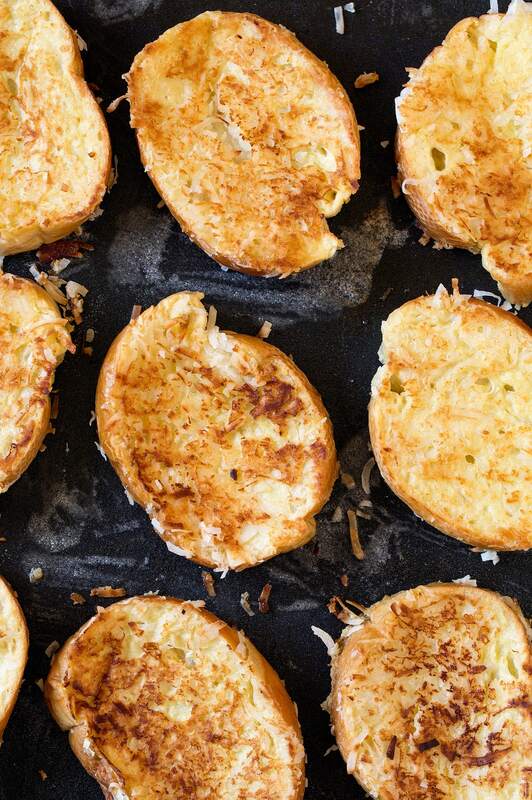 Ordinary French toast gets a major upgrade with a few delicious coconut additions. 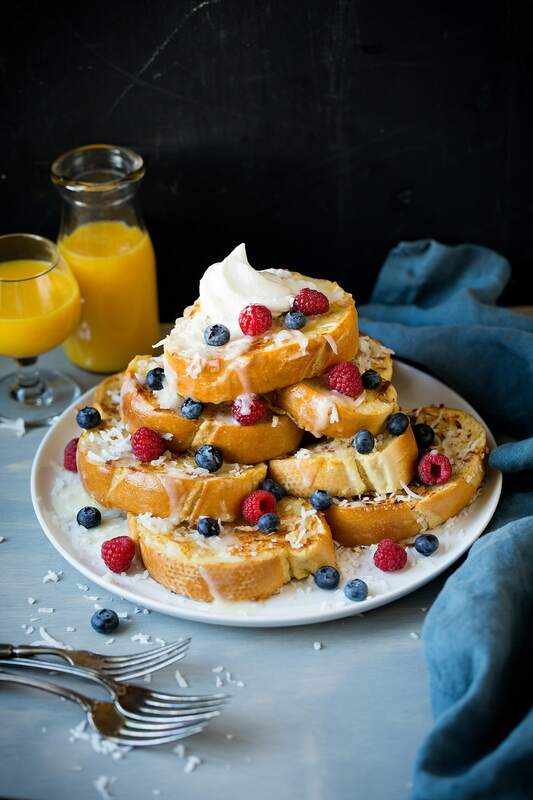 This tempting french toast is made with creamy coconut milk, real coconut flavor from pure coconut extract, then after cooking it’s drenched with an irresistible, deliciously sweet coconut syrup (which by the way is also just as delicious on pancakes and waffles)! In other words say hello to a new favorite weekend breakfast! It’s a tropical tasting treat that you’ll want to make year round. Serve it with a side of pineapple and top with macadamia nuts to pair with the flavor theme. An electric grilled works great for this recipe, or a griddle for the stovetop or several non-stick skillets work well too (cook over medium heat, reducing temperature as needed). Preheat a non-stick electric griddle. In a blender, combine coconut milk, eggs and coconut extract. Pour mixture into a shallow dish. Pour shredded coconut into a separate shallow dish. Transfer to coconut and coat both sides. Cook through on buttered griddle, turning once. Tip – keep an eye on the coconut. It can be a delicate ingredient with hotter heat so reduce griddle temp slightly as needed if it’s browning to much before french toast is cooking through. Stir in sugar and buttermilk. Bring mixture just to a gentle boil over medium heat, stirring frequently. Remove from heat and stir in baking soda and coconut extract. Whisk mixture for about 10 seconds until frothy. 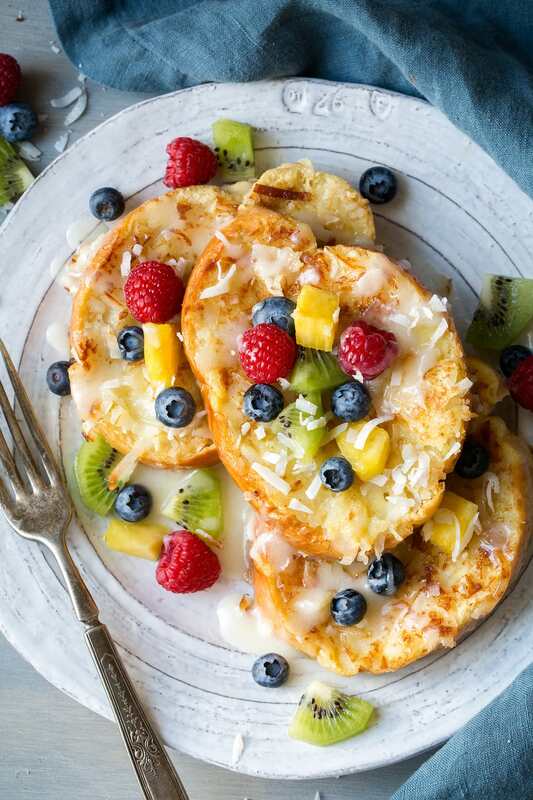 This tempting french toast is made with creamy coconut milk, real coconut flavor from pure coconut extract, then after cooking it's drenched with an irresistible, deliciously sweet coconut syrup (which by the way is also just as delicious on pancakes and waffles)! Preheat a non-stick electric griddle to 350 degrees. To a blender add coconut milk, eggs and coconut extract. Blend on low speed just until well blended then pour mixture into a shallow dish. 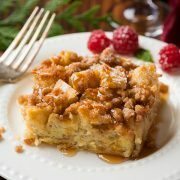 Pour coconut into a separate shallow dish (if you want to crust the french toast with coconut, it is optional). Working with one slice of bread at a time dip into egg mixture and allow bread several seconds to absorb the mixture then allow some of the excess to drip off. Transfer to coconut and coat both sides. Cook on buttered griddle until golden on bottom, then lift bread with a spatula and butter griddle again. If needed reduce griddle or burner temperature slightly so coconut doesn't burn before center of french toast is cooked through. 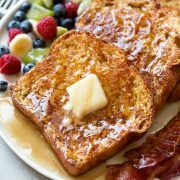 Flip french toast to opposite side and cook opposite side until golden brown. Serve warm with coconut syrup. 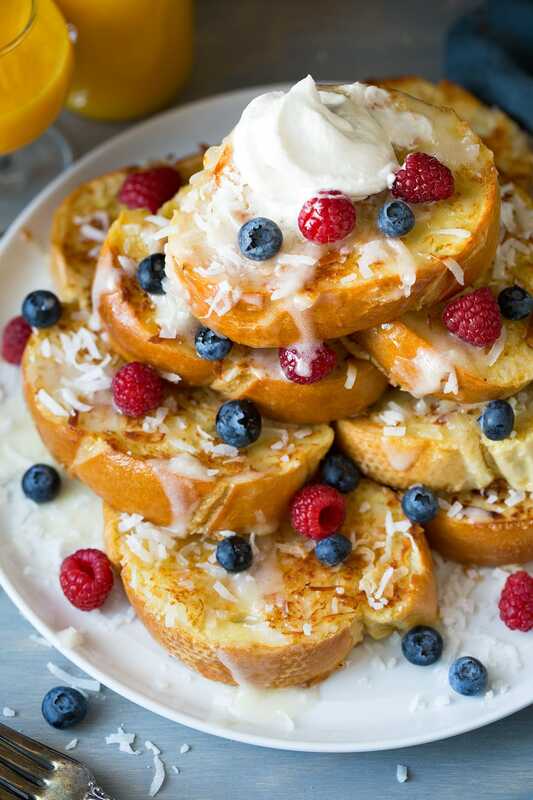 If you didn't crust the french toast with coconut you can also just sprinkle some over the top. Melt butter in a medium saucepan. Stir in sugar and buttermilk. Bring mixture just to a gentle boil over medium heat, stirring frequently. 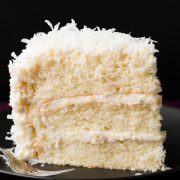 Remove from heat and stir in baking soda and coconut extract, whisk mixture for about 10 seconds until frothy. Serve warm. 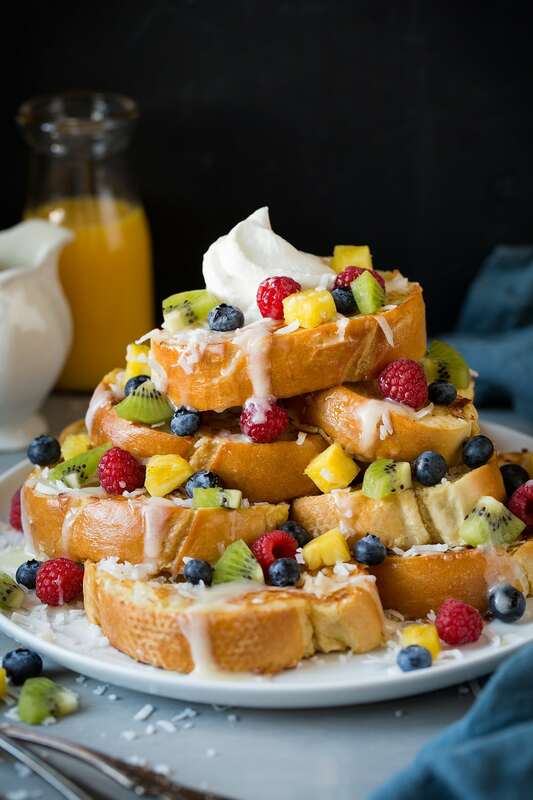 Nutrition includes french toast and syrup but shredded coconut is not included.